Year 13 student, Josh Mock has curated two unique events which will take place during LGBT+ History Month (February) to showcase LGBT+ composers and artists. 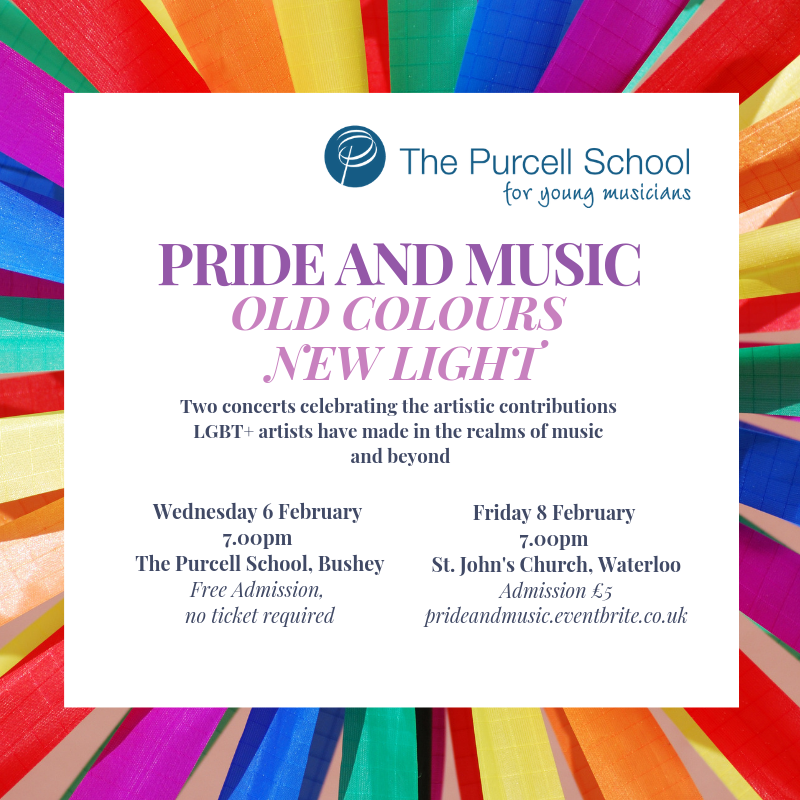 The first event, taking place at The Purcell School on February 6th, will feature new works written by Purcell School students, who have been inspired by LGBT+ artists and creators, performed by the innovative PRISM Ensemble. The second event at St. John’s Church, Waterloo on February 8th will feature LGBT+ music from across the centuries – everything from Tchaikovsky to arrangements of Queen and Britney Spears, and will be a celebration of LGBT+ art, music, and culture. Why is this concert important to you? This concert is chance for me to showcase and celebrate a small section of the wonderful musical output that the LGBT+ community, a community I am proud of, has produced across time. Hopefully I can highlight the importance of their work and show other young people – queer or not – that their identity should not be a barrier to expression and that they should take pride in the communities they are apart of. Why do you think there is a need to highlight LGBT+ music? How did you choose the repertoire, and why are you focusing on some less well known composers/pieces? What has it been like as a student curating and organising these events? Although organising these events have been extremely challenging, it has been an invaluable learning experience. I’ve had to approach individuals and organisations out of the blue, organise rehearsals, hand out flyers, attend meetings etc. In the process I’ve learnt how to pitch my ideas effectively, the importance of clear communication, and people management skills. I could not have done this alone, and I’m so grateful to all those who’ve helped with organising, spreading the word, and giving sage advice, as well all the students who have so graciously (and keenly!) taken part! I would encourage young musicians to put on events, as the skills you learn in the process will stand you in good stead for being a professional of any kind. Who are your LGBT+ role models? I’m quite lucky in that I am involved with an LGBT+ Youth Project in Manchester called The Proud Trust, who work tirelessly to support queer youth and the wider community, and so many of the volunteers and workers there have been inspiring and nurturing. I’m also a huge fan of Vicky Beeching, a former Christian recording artist who chose to come out and leave her career as a musician in order to advocate for better inclusion of LGBT+ people across society, especially within the church. Her vulnerability is admirable, and I am in awe of her intellectual abilities! I would recommend that everyone read her book and follow her on Twitter! My final role model is Harvey Milk, the first openly gay person to be elected to public office in America. He worked fearlessly and tirelessly to further the LGBT+ cause, until he was murdered by a colleague. I highly recommend the film Milk if you want to find out more – but make sure you have tissues nearby!